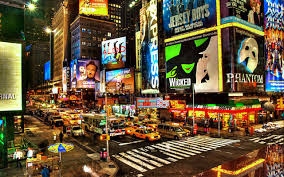 Story: Lights of Times Square - Something New Everyday! During a winter trip to New York last year we arrived at our hotel at around 1 am when my son Khalifa looked out at the lights of Times Square and said he wanted to go outside. I told him it was too late and that we would go tomorrow, but he kept looking out the window and said "Just for 2 minutes". My wife and I just looked at each other, smiled and said "2 minutes". We got dressed in our big jackets and beanies and went to the center of Times Square. When we got there my son pointed at the lights and said "Baba look" then fell straight to sleep. It took us 20 minutes to get ready for the 20 seconds our son took to see the lights of Times Square, but he was so happy and that is all that matter to us. That night I learnt an important lesson on creating happiness in life. It's that we always have the ability to create special moments in our lives but we usually find an excuse to do something else. There are so many examples, the spouse suggests a fun day, we say "it's too hot", the spouse suggests to drive to another city for a festival, we say "it's too far", the spouse tries to wake you up for a beautiful sunrise, we say "it's too early". Leading a life of happiness requires effort from you. That night I learnt to stop being the biggest barrier to my own happiness. I now understood that although happiness is a door that is always open we are the ones who decide if we are going to step forward and walk through that door. The reality is just like it took us 20 minutes to get ready so my son could look at the lights for 20 seconds, it's going to feel that you are putting in more effort than what it's worth. Is it really worth driving 3 hours for an event that is going to last an hour? But think about everything in between, the fun drive with people you love and the memories you will create that will last a lifetime. You will then realize that it is worth it, you will then realize that in life those moments are what truly counts. Beautifully written. I always admire such write ups. I am happy the son enjoyed it. I live in New York too.